(With additions from various other authors and AHT archives. (Ed notes and acknowledgements. Ingeborg James of Spectrum kennels, Vancouver, British Columbia published the book "Canadian History and Statistics (1981)" and she graciousy gave Lillian Goodman permission to use some of the little-known information about the first decade of the breed in Canada in Ms Goodman's Our Afghans article published in 1984.. We have added a few additional extracts from Ingegorg James book which space limitations in the original OA article prevented their inclusion. We have also added some biograhical information researched by Lyall Payne, and some photographs from various archival sources, and pedigrees from our database. 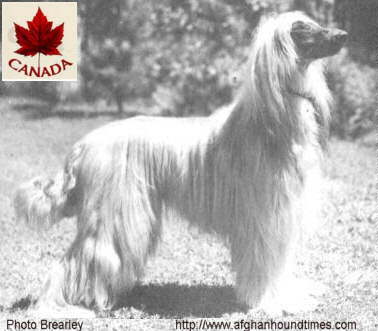 We also acknowledge and thank Pam Croft, Afghan Hounds Internationsl (some photos and pedigrees), Joan Brearley (photos from her book), Lyall Payne (Biographical research), and of course Lillian Goodman for the original article. In this article we are covering the early days of the breed in Canada up to around the mid 1940's. Canadian breed history after this period continues to be very interesting, and will be subject to further research and future articles. The first dog show in Canada was held in September 1881 in London, Ontario.. The next dog show was held in Ottawa, Onatrio in 1883. Initially, from 1885, dog shows in Canada were held under the rules of the American Kennel Club and Canadian dogs were registered in the AKC stud book. In 1888 the desire for a national Canadian club was realised and at a general meeting held at Tecumseh House in London, Ontario, The Canadian Kennel Club was formed. Richard Gibson of Delaware, Ontario was the President and C. A. Stone of London was the Secretary. Two of the Vice-Presidents came from Quebec and one from Winnipeg. By 1889, the fledging Club had its own official publication. The Kennel Gazette, which was printed as a supplement to The Canadian Poultry Review. In 1893 a gentleman exhibitor from Philadelphia, USA entered 32 dogs, and another gentleman from Boston, USA made an entry with 24 dogs. (source Inge James), imagine transporting such a huge number of dogs by train or horse and cart! By 1894 the CKC was in crisis, membership had fallen to 143 and the clubs expenses exceeded its income. In view of this dire situation CKC approached the AKC for amalgamation and a lengthy agreement was drawn up. This arrangement killed the entity of the CKC which became just another member of the AKC operating under the banner of the Pacific Kennel League. Canadian dog clubs resumed the earlier system of sending their applications for show dates, together with their deposits to the AKC and functioned under its rules. Canadian dogs were once again registered by the AKC. Canadian fanciers were not happy with this arrangement and the arrangement was cancelled after six months. In 1896 the governing body for the Sport Of Dogs had become the Canadian Kennel Club "Inc". The CKC slowly progressed with an increase in interest and in entries at their shows. In 1913 CKC faced a new challenge - some west coast fanciers decided to establish a second governing body for dog shows - "The Dominion Kennel Club". CKC and DKC met with the intent of uniting. Unification did not occur and competition between DKC and CKC continued. Eventually in 1913 CKC implemented a rule effectively proghibiting CKC members from officiating at dog shows not held under CKC rules. CKC actually dismissed 35 officers and members who had defied this rule and officiated under shows not run under CKC rules. In 1914 the CKC became incorporated within the Live Stock Records Commitee with the office based in Ottowa. The Federal Department Of Livestock helped fund the Live Stock Records project in the form of grants and rent-free, paid heating etc for their offices. An obvious advantage for CKC in keeping their costs down. CKC made some further further rule changes, one of notice being that for the title of champion, points would have to be won under three different judges, instead of the former two. At the same time, the CKC recognized all breed standards that had been adopted by the AKC.